Nearly a decade after his triumphant Charlie Chan biography, Yunte Huang returns with this long-awaited portrait of Chang and Eng Bunker (1811–1874), twins conjoined at the sternum by a band of cartilage and a fused liver, who were “discovered” in Siam by a British merchant in 1824. Bringing an Asian American perspective to this almost implausible story, Huang depicts the twins, arriving in Boston in 1829, first as museum exhibits but later as financially savvy showmen who gained their freedom and traveled the backroads of rural America to bring “entertainment” to the Jacksonian mobs. Their rise from subhuman, freak-show celebrities to rich southern gentry; their marriage to two white sisters, resulting in twenty-one children; and their owning of slaves, is here not just another sensational biography but a Hawthorne-like excavation of America’s historical penchant for finding feast in the abnormal, for tyrannizing the “other”—a tradition that, as Huang reveals, becomes inseparable from American history itself. 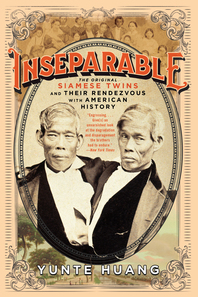 “After years of showcased servitude, the original 'Siamese twins' Chang and Eng Bunker settled down in small-town North Carolina and adopted the lives of 19th-century Southern gentry — identifying with the white oppressor class, in other words, fathering at least 21 children between them, owning slaves and sending their sons to fight for the Confederacy. Huang is attuned to the ironies of their story in his incisive and riveting account.” — New York Times, "Times Critics' Top Books of 2018"